Our JAPANESE BIRDS VER 1 art was created in house by artist Kade Strange. The art is then type II anodized into the machined aluminum panels. Anodizing is a process which changes the surface of the metal. It is not a paint.. or a hydro dip… or a sticker. The only way it can be damaged is with some form of aggressive abrasive, like sandpaper. It will last a lifetime as long as you don’t abuse it! 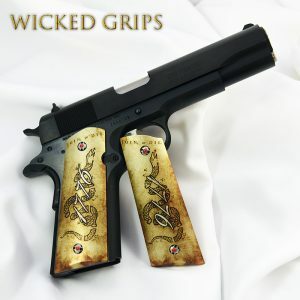 Our 1911 sets are made to fit a wide variety of 1911 fullsize handguns from all the manufacturers. 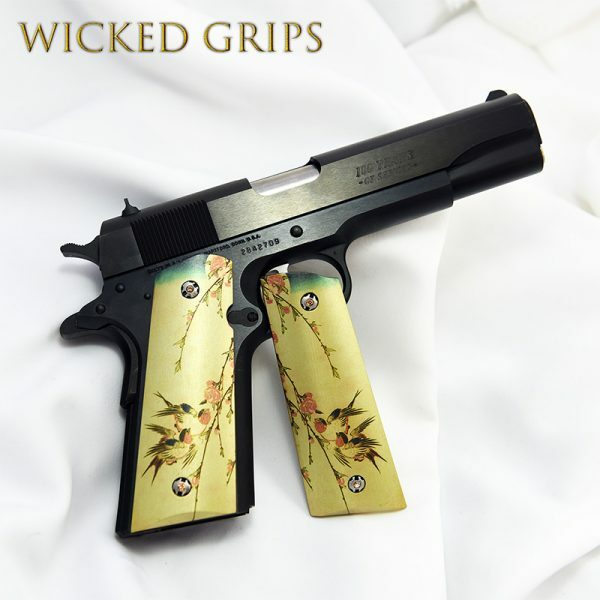 We show the grips mounted to actual guns, with our custom screws so you can visualize how the finished package will look on your favorite 1911 pistol. Not sure what you need? 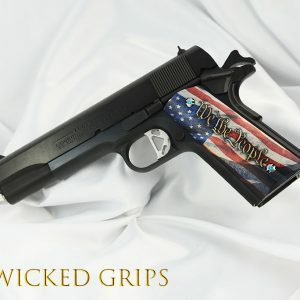 Confused by all the terms and different makers model names? 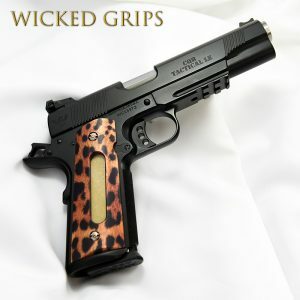 Please click here for our blog on identifying what grips your 1911 takes! 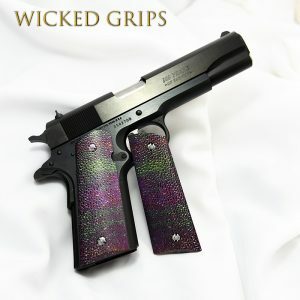 What grip does my 1911 take? 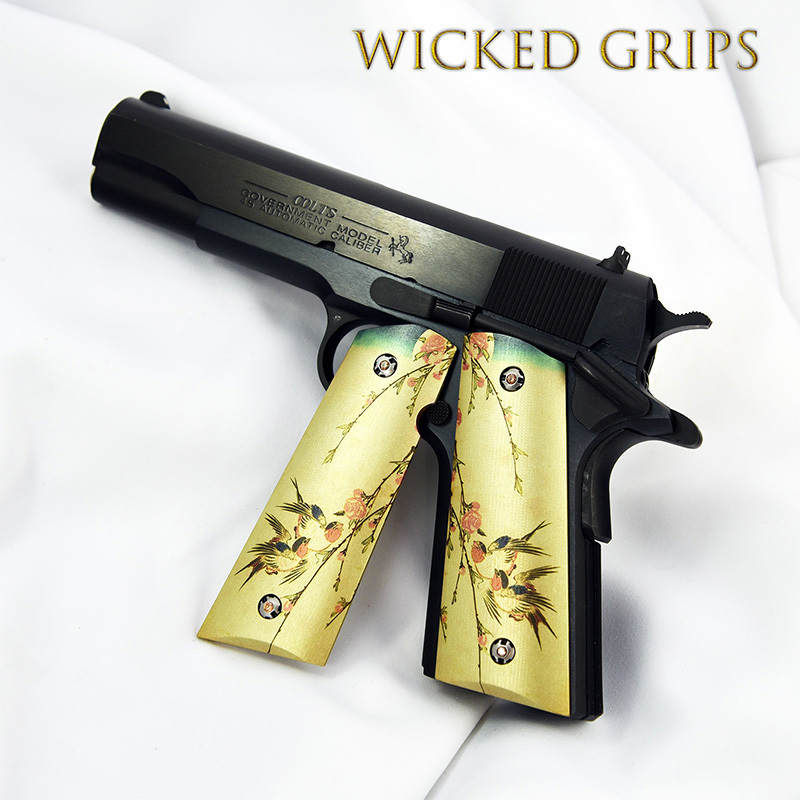 AS WITH OUR WOOD LINE CUSTOM GRIPS, EACH SET WILL COME PACKED IN OUR COLLECTORS TIN!